Maybe I’m just odd that way but I like getting the AKC certificates in the mail, too. 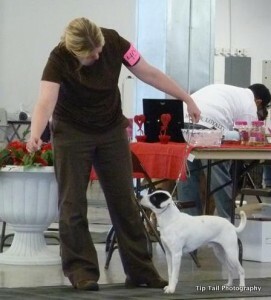 And I hope to be getting some of those in the future for his agility! 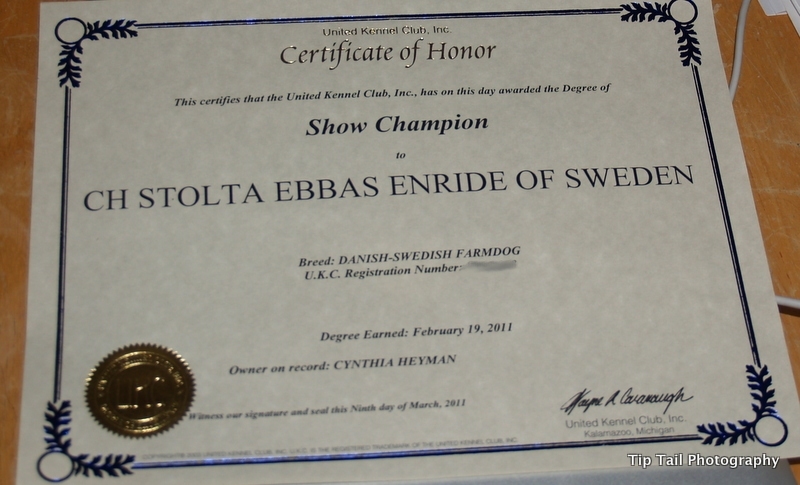 I am pretty sure Jet is the first Danish-Swedish Farmdog with a UKC championship in the USA. I guess it’ll cost me $25 to know for sure, as they have to ‘research’ it. Which I think is odd, because why wouldn’t they just know? Oh well, I guess they want to make some money. I haven’t decided yet if I want to spend the money to find out but I just might. 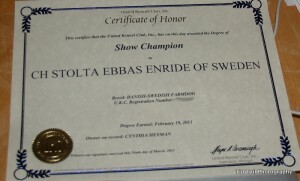 So Jet, his official name is CH Stolta Ebbas Einride of Sweden, now, note the CH before his name. Yay! YAY Jet! Way to go both of you thats a really cool accomplishment! I like getting certificates too, and I haven’t even ever got a really important one like that.LOL Congrats! WHOOHOOOO congrats to both of you, that is so cool! Whoohoo all the way from Sweden too! Congrats from all of us@Stoltaebbas!